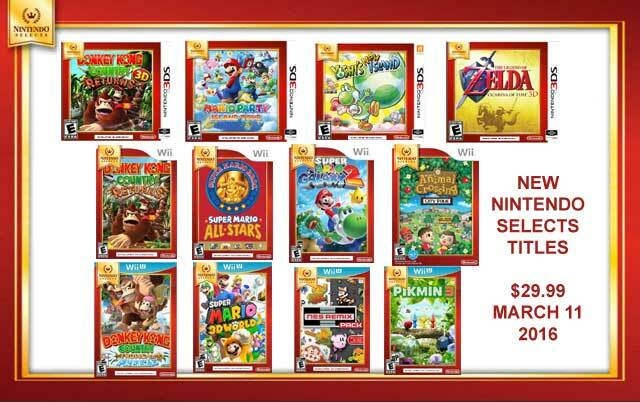 A new wave of Nintendo Selects will hit North American retailers on March 11, according to Video Games Plus. The lineup includes several Wii U/3DS titles, and surprisingly, some old Wii releases as well. Pikmin 3, Super Mario 3D World, Donkey Kong Country: Tropical Freeze, Zelda: Ocarina of Time 3D, and Super Mario All-Stars are just some of the included games. For those that are unfamiliar, Nintendo Selects typically bring about lower prices for games. It looks like some older ones will be seeing reprints as well – notably Pikmin 3 and Super Mario All-Stars. Video Games Plus lists each new Nintendo Select at $29.99 CDN. That should amount to $20 USD. Nintendo has not yet officially announced this new batch of Nintendo Selects. Presumably though, we should be getting an announcement soon.